Whether it’s cake form or cupcakes, Funfetti has become one of the most popular options for birthday cake, especially for kids’ birthdays. Funfetti dip turns this delicious cake into a creamy, silky dip. It is made using Pillsbury Funfetti Cake & Cupcake mix. And you can enjoy it with animal crackers, graham crackers, or even fresh fruit. For more awesome dessert dips, try our s’mores dip, cookie dough dip and our pumpkin cream cheese dip. Picture this: you’re in the kitchen, cooking a cake for a birthday coming up, and you sneak a lick of your finger after it has been dunked into the batter. Admit it, you’re guilty of this. I know I am! Why is the batter always so good? Well, obviously we can go around just eating batter, we tell our kids not to! But I have another solution. 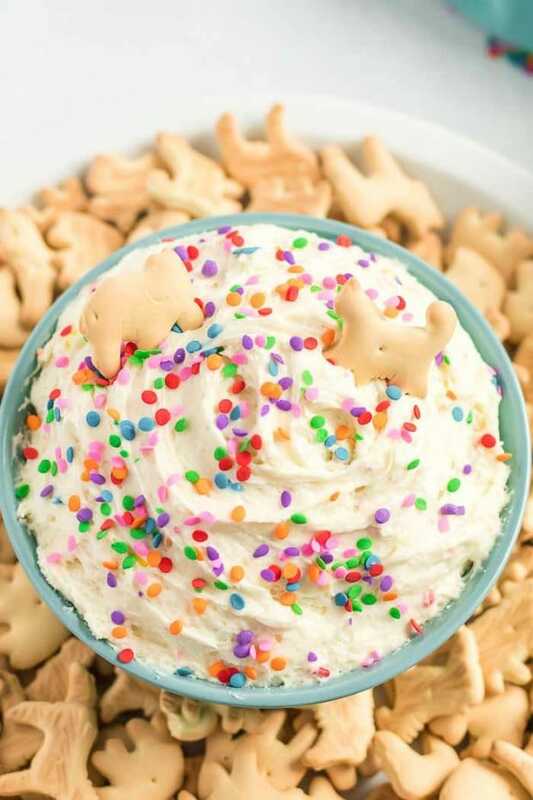 This Funfetti cake dip. It’s a no bake, cake flavored dip that is sooooo delicious! It’s just as good as the batter itself, and the best part is you can feel free to eat as much as you want, unlike the actual cake batter itself. With only four ingredients it is ready in no time and it’s a sweet treat that not only do the kids go crazy for, but adults will love it too. In a bowl, use a hand mixer to cream together the cream cheese and whipped topping until it the mixture is smooth. Add the cake mix and half of the heavy cream and mix, gradually adding in a bit more cream until you’ve reached the desired texture for the dip. 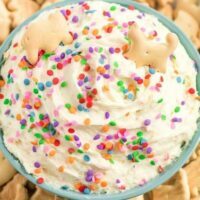 My go-to is to serve animal crackers with the Funfetti dip. It reminds me of the Dunkaroos I used to eat when I was younger. But sometimes I will switch it up and serve the dip with graham crackers or vanilla wafers — anything that’s crunchy and a little sweet. If I want to be on the “healthier side” I will serve my Funfetti dip with fresh fruit. I especially think it pairs well with fresh pineapple, strawberries, or grapes. It has a similar taste to the marshmallow fruit dip you can make or buy at the store. It’s best to store Funfetti dip in a covered container and keep it cool in the fridge. If you plan to serve it again, take it out about 5 minutes before serving it to let it soften just a bit — and make it easier for dipping. 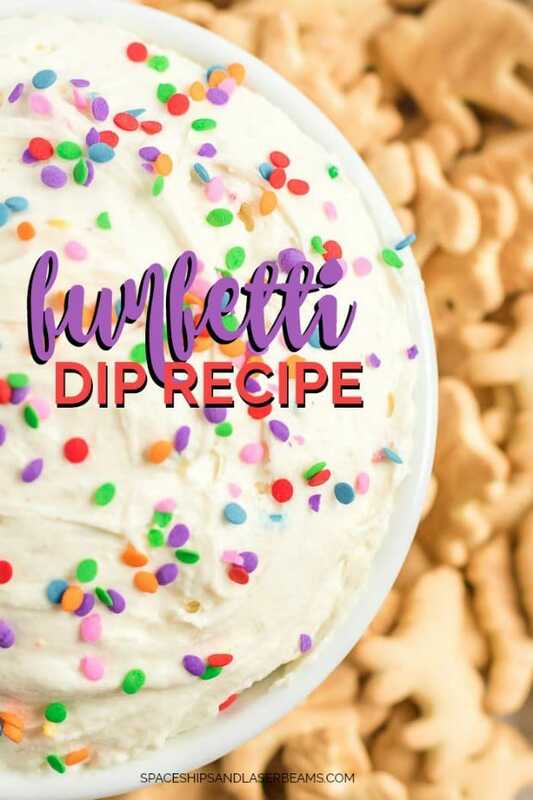 If you are a fan of Funfetti cake or cupcakes, you will LOVE this Funfetti dip. It is one of the best sweet treats and it couldn’t be easier to put together. It’s a guilty pleasure of mine, and a not so guilty favorite for my kids. 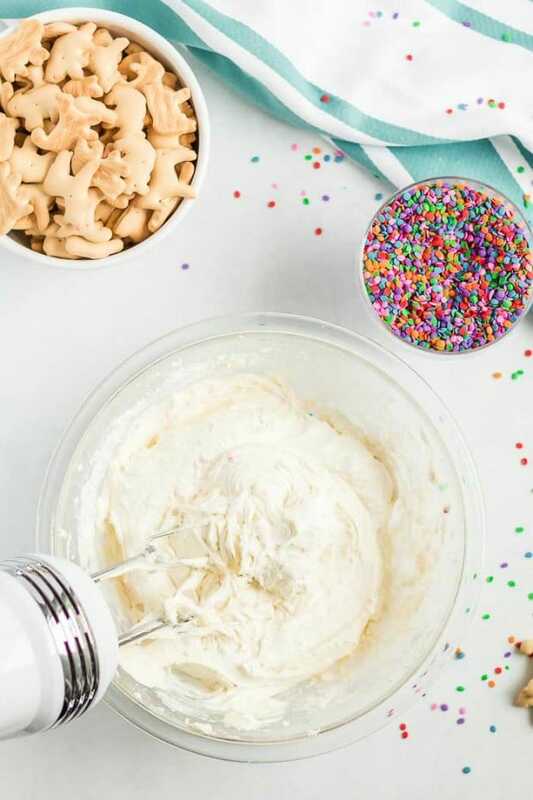 Funfetti dip turns this delicious cake into a creamy, silky dip, perfect with animal crackers, graham crackers, or even fresh fruit. In a bowl, use a hand mixer to cream together the cream cheese and whipped topping until the mixture is smooth. YUM! My boys will love this! !